If you thought that Karl Lagerfeld deserved a medal for all that he does and has done for fashion, photography, architecture, design and culture in general, you are not alone. 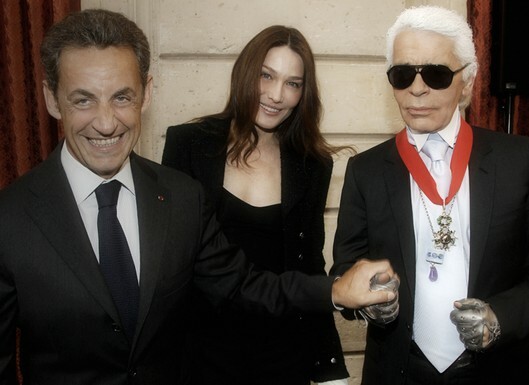 Our favourite uncle received the Legion of Honour at the Elysée presidential palace yesterday, along with a little private palatial garden party thrown by French President Nicolas Sarkozy and his wife Carla Bruni-Sarkozy, who is no stranger to fashion fêtes given her former title of supermodel. The French Mint and Chanel’s fine jewellery artisans created the one-of-a-kind medal for the designer, which was perfect with the rest of his look. Congrats to our grand couturier uncle, without whom fashion would be oh-so-boring. Don’t be surprised if medals show up in the next Chanel collection. Previous Post Super Friends or Super Trends?